late again, i know. i’ve been down & out the past 2 weeks with an acute upper respiratory infection…not fun. today is the first day that, knock on wood, I feel comfortable saying that i feel like i’m over the hump and starting to get better. thank GOODNESS! something that did make my week sweeter and help the recovery process along was realizing that Graeter’s Ice Cream, a Cincinnati staple, is now sold in Nashville! There are a few food items that Cincinnati is well known for; Skyline (not Gold Star) Chili, Montgomery Inn (BBQ chicken & ribs) and Graeter’s Ice Cream. (note that a few other local food spots are on my must hit when i’m home list, including United Dairy Farmers Ice Cream and Dewey’s Pizza – which wasn’t necessarily started in Cincinnati but I can’t find one any closer to Nashville). All of which were not only around in my childhood, but necessities in my college years. Through a friend’s tweet on thursday, i learned that nashville was one of the cities on the latest “now sold in” cities that Graeter’s ships their amazing sweets to. AMEN! I made sure that a trip to the closest carrying store was made before dinner yesterday, and i’ve had to hold myself back from eating the whole pint in less than 24hours. Some of my favorites: all time would have to be their chocolate chip cookie dough – second the mint chocolate chip and third the black raspberry chip. my suggestion: get one with chocolate chips in it. you’ll enjoy the softest, creamiest dark chocolate chunks i’ve ever had in a frozen treat…i think i’m going to have to go get another bowl now…. if you’ve never had it – TRY IT! 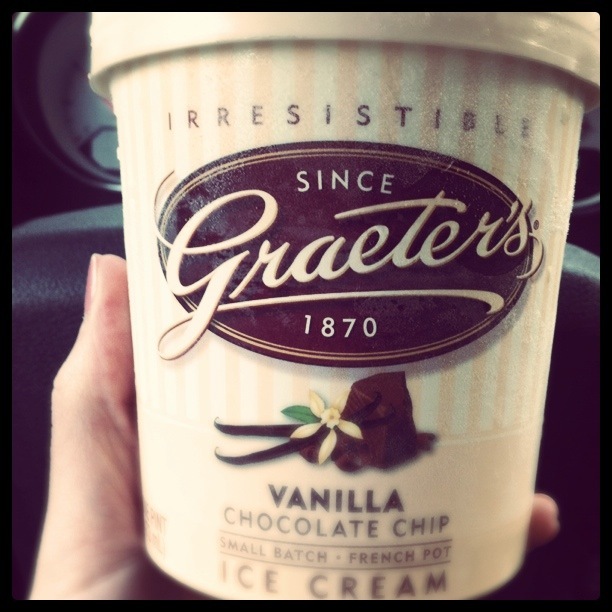 go to www.graeters.com and enter your zip code to see if a store near you carries it. you will not be disappointed! Previous Post wednesday motivation – color me red!